The Douro river is a unique destination in Portugal. Nested into a mountainous region the river give birth to the oldest denomination area in the world, and forever linked to the Famous Porto Wine. Hanging from the slopes, cycle little roads that take you to spots along the Douro and other valleys, to the top of the hills and enjoying the discovering historical villages and towns. Along the way countless wineries inviting you to a glass of wine, Porto Wine or others. Feel the atmosphere of a Portugal still untouched and avoid the crowds finding a diferent Portugal. Day 1 Welcome at Airport & Transfer to Amarante. Welcome to Portugal! You will pick you up at the airport. Make yourself comfortable in the car while driving to the Hotel. A transfer will take you to Amarante. Beautiful city and historical center town and starting place of your tour. Welcome briefing and handover of bicycle will be held at the Hotel. Free time to enjoy the hold town center. Enjoy Amarante old Town Center, this well preserved historical area is of imense history related events. The São Gonçalo Church is the main atraction and why not learning about this " Saint" ! The bridge over the Tamega River was rebuild by the Saint and saw the french troops of Napoleon stopped fro several days here. Stroll around the market place and along the cobbled streets of Amarante. Day 2 Cycle Amarante to Caldas de Aregos. Leaving Amarante your path will take you to an mountain pass, in the way the typical scenery of rural north Portugal. Small villages in a mixed scenery of vineyards and agricultural small fields and forest. Once on top the Douro await you, terraces of fields and vineyards will become more and more present has you approach the river. Wonderful views are in every corner. 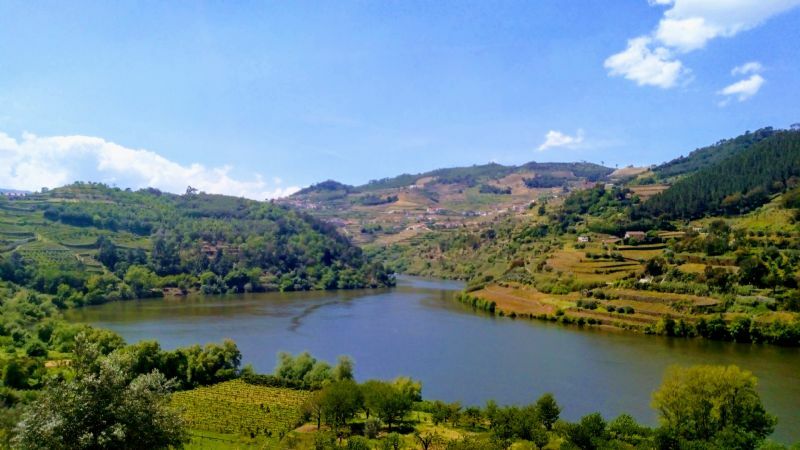 Mesão Frio will be the first real town into the Douro region. It feels lazy and somehow stopped in time. Now you are along the vineyards towards the river and the cycling is easy. Day 3 Cycle Caldas de Aregos to Lamego. Ascending the Douro Valley slopes to reach Lamego you'll follow the Wine Terraces. Along the N222, road that have being quote by Avis the "best car ride of the world" take pleasure within the scenery. 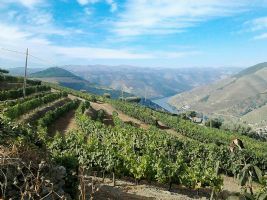 This winding road is your entry into the famous Hight Douro Vineyards and UNECSO classified region. The road takes you up and once you leave the N222 you are gaining elevation to arrive at Lamego. Lamego is a wonderful town, high in the Douro slopes and offer an amazing number of visit options. The Castle and the town inside the walls, the Cathedral, and the Sanctuary closing this beautiful postcard. The cycling will pass nearby all without forgetting the Lamego Museum.…. Day 4 Cycle Lamego to Tabuaço. The day starts following the Varosa River Valley. Across the hilly terraces that produce sparkling wine you arrive at a river cross, Ucanha village and its medieval toll bridge. Not far the monastery of Salzedas another remind of the region’s history. The day is also of higher sceneries as you almost reach 800m… Other villages of the South Douro will be on the way. Granja do Tedo is feeling away from modernity. Not far from the arrival Barco. The Village is another of the Portuguese Wine villages, and offers stunning views of the terraces, just before arriving at Tabuaço…. Day 5 Cycle Tabuaço to Alijó. Starting with a long descent to the Douro, this journey will take you back to northern shore of the River. The landscape is of terraces as far as the horizon. Every slope is of vineyards!!! Take the ride down as once arrived at Pinhão, the center of High Douro. The ride is up once again, rising from the Douro. Stop at a known belvedere to enjoy one of the best views over the river and vineyards. Now is leisure as you bike along the ridge and borther of the valley. Overlooking the new water reservoir of river Tua Dam, São Mamede de Ribatua is a peaceful village that once again maintain the regions characteristics. Alijó nearby is looking for you with a glass of Favaios wine…. Day 6 Cycle Alijó to Vila Real. Favaios is your first stop of the day. The little wine village of Portugal is home of old bakeries that still make bread as hundreds years ago. The place is also known for it famous wine, in Portugal, The Favaios is from the vineyards around pay a visit to the museum and know a litle more and have a taste. The Pinhão valley is of stunning beauty and the major challenge of the day. Back on top Sabrosa home town of the biggest sailor of the world Ferdinand Magelland, his house is still here. Vineyards are now leaving the route and reappear near Vila Real. Casa de Mateus and the Mateus Rosé are just at the city entrance. It is a well worth visit. 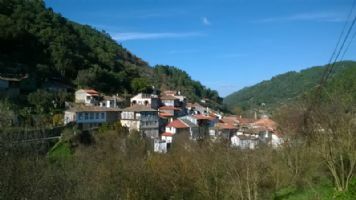 Vila Real is waiting, the biggest urban area of all the Douro region still have lot to offer by the historical center…. Day 7 Cycle Vila Real to Amarante. To finish this amazing tour around terraces, vineyards, towns and villages from the Douro. 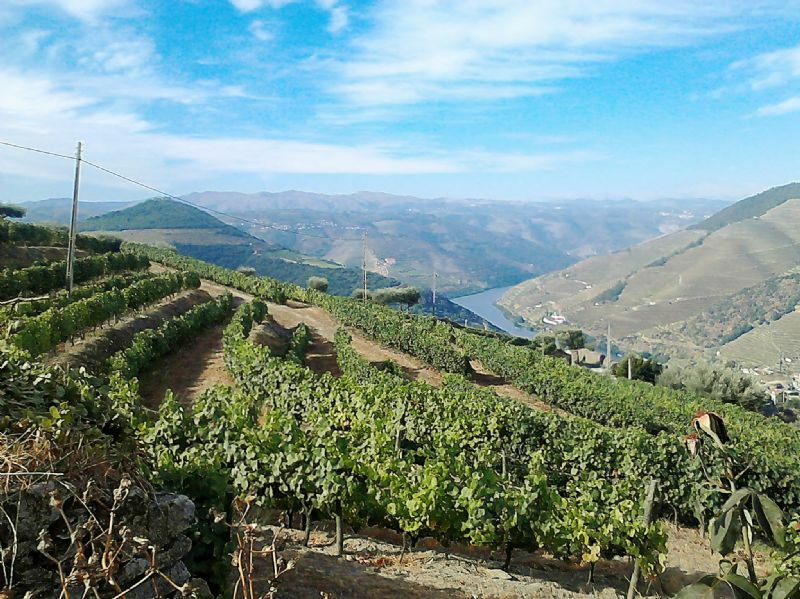 It is time to present you the mountain massif that allow the climate in the High Douro. The Marão massif that you are crossing into to reach Amarante. Nowadays a huge tunnel offers fastness to reach each side. You are taking the old N15 (national road) that snakes up and down this range. Going thru the villages now almost empty, that from one and the other side are perched. The terraces are now field, from grazing, or vegetable culture… The vineyards stayed behind…. 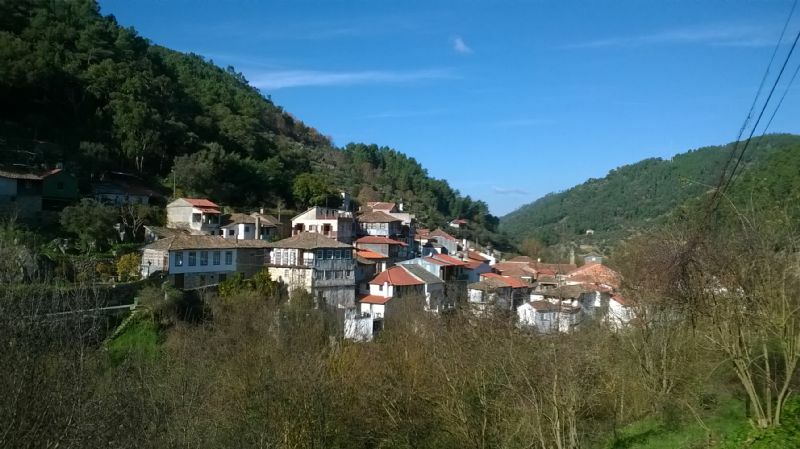 The historical center and São Gonçalo Church are welcoming you back…. Day 8 Transfer to Porto & Tour's End. On this departure day a transfer will take you back to Porto, the airport or other lodging in the City. Transfer will meet your flight schedules. You can ask for a latter transfer if you are staying in Porto, please inform us to check our availability. END OF TOUR ONCE IN PORTO. * Handhover of all bicycles and Bike fitting. * 7 nights lodging on Comfort (2*/3*) or Superior (3*/ 4*) accommodations on BB basis. * Support vehicle during Cycling tour. Choose your departure date later than 30/04/2019. Keep in mind that the departure date should match with the day one of the program. If your flight to portugal envolves an overnight, please don’t consider that day. Private company with share capital, based in Rua Conde de Sabugosa, 3F, 1700-115 Lisbon; social capital 99.759,60€; held under license nº 7236 enrolled at Conservatória do Registo Comercial de Lisboa; legal entity number 504163590, Charter number 953/1998. The trips presented on this website are valid according to the dates and prices mentioned, unless otherwise indicated. The general conditions of participation in one of our programmes are complemented by the specific conditions of participation included in the programme of each trip. 1.1. To enrol in one of our programmes, the Client must fill in an enrolment form available online, or send it to us duly completed and signed. The payment of 30% of the total amount of the programme must accompany the enrolment form. 1.2.2. Asserts that he has the physical and psychological conditions necessary for the programme he’s enrolling in, assumes the responsibility and accepts the possibility of taking the risks that are a part of the programme of his trip. 1.3. The organizing agency can group in pairs, by gender and by order of enrolment those clients that sign up individually for the same trip; if the number of participants turns out to be an odd one, the individual who remains alone will have to pay an individual supplement. 1.4. The Client is obliged to pay the remainder of the total price of the programme (70%) up to 45 days before the date scheduled for departure. If the enrolment takes place 45 days, or less, before the departure date, the total price of the programme has to be paid upon registration. In this case, enrolment will be conditioned until confirmation can be obtained from all the service suppliers involved in the specific programme. 1.5. The organizing agency reserves the right to cancel any enrolment in case payment is not made according to the above mentioned rules. The Client will then be responsible for all expenses and charges indicated in number 9. 2.1. The Client must hold valid documents, such as passport, visa and travel insurance. 2.2. The organizing agency cannot take any responsibility if a Client is refused a visa or entrance in Portugal. The Client must take full responsibility should one of these situations occur, and he will be liable in terms of costs, according to the rules established in case of withdrawal from the trip as indicated in number 9. 3.1. The responsibility of the organizing agency of the trips included in this programme is covered by an insurance of liability provided by the insurance company TRANQUILIDADE and a bank guarantee provided by TOTTA, according to current legislation. 4.1. The prices presented in this programme are based, among other factors, upon the costs of the services indicated on this webpage and possible publications in different formats issued by this agency, which means that prices are subject to alterations that may result from variations in fuel prices and transportation, housing and meals, guide services and taxes. The prices of the trips include VAT (Value Added Tax). 4.2. Travel insurance is not included in the price; however, it is compulsory and it has to be arranged by the Client. It is valid only during the trip. 4.3. If the Client wishes accommodation on a single room, and such is possible, there is an added value that varies according to the trip and, in each trip, to the category of the rooms available. These values will be displayed in all the elements of the trip the Client is booking. If this value is not on display, it will be communicated to the Client via phone or email. 4.4. Should an alteration occur regarding the price of the trip, the Client will be immediately informed and, within the established deadline, he can choose to accept the alteration or cancel his enrolment, according to the terms defined in number 8. 5.1. If a Client has signed up for a trip and then wishes to alter his enrolment for a different trip, or the same trip departing on a different date, in case that alteration is possible, he will have to pay a supplement to cover alteration charges, with a minimum value of €50. However, if this alteration occurs within 21 days, or less, of the departure date, or if the service suppliers for the trip do not accept it, the Client will be subject to the expenses and charges defined in number 9. 5.2. As long as there are valid reasons that justify such measures, the organizing agency may alter the order of the events in the programme, departure schedules and hotels (within the same category). In this case, the Client will not have the right to any reimbursement or refund. 6.1. If the Client decides not to use all the services that were a part of the programme, he will not be entitled to a refund. 6.2. If any of the services programmed for the trip cannot be provided for reasons that are not of the responsibility of the organizing agency, and if there is no possibility of replacing these services with something similar, the Client has the right to a refund that makes up for the difference between the price of the programmed services and those effectively provided. 7.1. The Client is allowed to cede his enrolment to another individual that fulfils all the conditions required for the specific trip, as long as the organizing agency is informed at least 21 days before the date scheduled for departure and the different service providers of the trip agree with the replacement. If these conditions are not met, it will be deliberated that the Client has withdrawn from the trip, according to the terms indicated in number 1.1. 7.2. The transferor and the assignee will be jointly responsible for the payment of the price of the trip and any additional expenses. 8.1. If the organizing agency, for reasons that are beyond its control, cannot provide one of the essential services included in the programme of the chosen trip, the Client will have the right to cancel his enrolment and be immediately offered a full refund, or he may choose to alter the choice of service or trip, with an equivalent price. 8.2. If for any reason beyond the agency’s control a trip has to be cancelled, the Client can choose between getting a full refund and changing his enrolment to another trip of the same price. 8.3. If the Client chooses a new trip that has a lower price, he will be given a refund of the remaining amount. 8.4.2. To cancel the trip at least 21 days before the date scheduled for departure, offering the Client a full refund of all amounts paid, without any liability on the part of the agency for this cancellation. If the client withdraws from the contract prior to commencement of the journey or if he doesn’t take the trip, he will have to pay all the expenses that his enrolment and subsequent cancellation imply, and a surplus amount of up to 15% of the price of the trip. The Client will be refunded the difference between the amount already paid and the above mentioned costs. 9.1.1. Delay – in case the agency has been notified, the Client will be regrouped with the other participants and pay for the costs involved. No refund will be due by the agency for services not used by the Client. 9.1.2. Cancellation – in case the agency has not been contacted via phone or email and informed of the reason why the Client did not show up, no refund will be offered by the agency. 10.1. The agency will only accept written complaints that are presented to the office responsible for the enrolment and payment of the trip, within a period not exceeding 20 days after the end of the service provided. These complaints, according to the directive of the European Council, will only be considered if they have also been presented to the service suppliers (hotels, guides, local agents, etc.) during the course of the trip and, in this case, documents that confirm the occurrence will have to be provided by the Client. 10.2. Should any conflict emerge from this contract, it will be settled by the Judicial Court of the district of Lisbon, with expressed waiver of any other. For all other issues not regulated by these General Conditions of Participation, Portuguese Law shall be applied.